Something I haven’t had till now was a really warm winter coat that was still stylish. And when I say warm, I mean REALLY warm…! 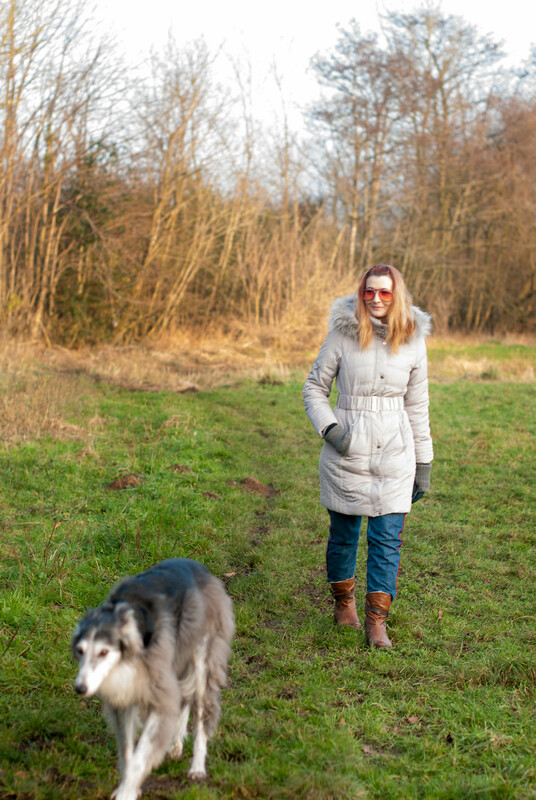 I have a big, thick khaki parka with a furry hood, but I generally reserve that coat for dog walks only – it’s a bit on the scruffy side. And it doesn’t have much in the way of insulation round the neck (despite its furry hood), so I decided to check out the sales for puffer coats. What I was looking for is exactly what I have here: A mid-length padded coat (that’s not black or khaki) with a furry hood and a stand-up collar inside the hood. Oh, and it had to be belted. In other words, I wanted something light, not sombre, that’s super warm for the winter and negated the need for a scarf, had a touch of faux fur glam and a bit of shape. That wasn’t too much to ask… was it?! I WANTED SOMETHING LIGHT, NOT SOMBRE, THAT’S SUPER WARM FOR THE WINTER AND NEGATED THE NEED FOR A SCARF, HAD A TOUCH OF FAUX FUR GLAM AND A BIT OF SHAPE. THAT WASN’T TOO MUCH TO ASK… WAS IT?! 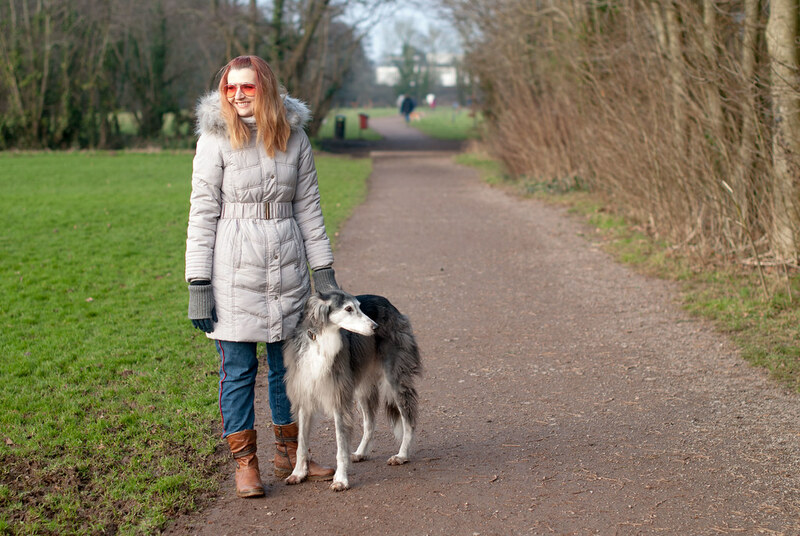 So after a bit of sale shopping I found this grey padded coat from Wallis – a bargain now it’s reduced to just £68… I was more than happy to pay that! Mine is a size Small and I usually wear a 10 – I did get the Medium to begin with but that was WAY too big. What I love so much about this coat is the fact that you can wear just a light sweater or sweatshirt underneath and that’s it – no scarf is needed because of the furry stand-up collar within the hood, and the belt keeps all your warmth in as well as giving you some shape. As we were just walking Riley and it was SUPER muddy I just wore my fantastically comfy Lotus boots (I think I’ve worn them Every. Single. Day. since getting them) and jeans. 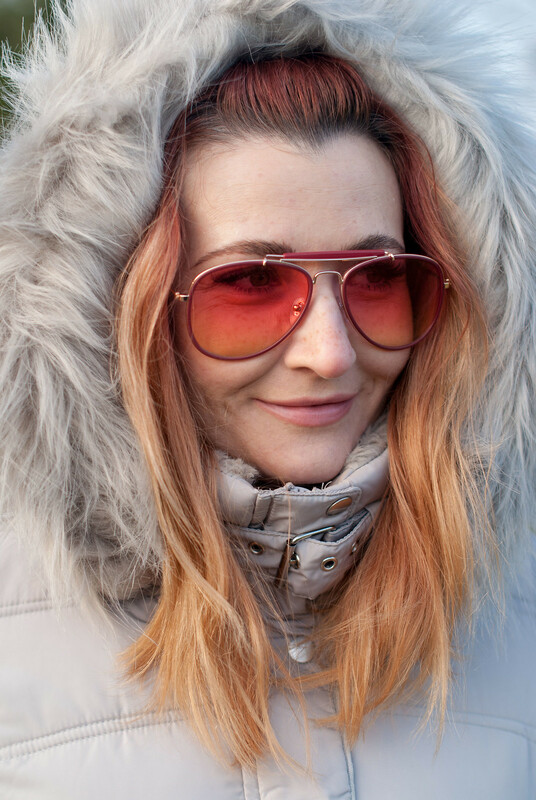 The orange aviators (similar) added a touch of colour and because you can still see my eyes it’s quite nice for chatting to other dog walkers – I don’t feel like such a diva and can make eye contact with them… does that make sense to anyone else? I tend to be a squinter even on grey days so always want to wear sunnies, but it’s nice to see other people’s eyes when having a chat. HAVE YOU BEEN HITTING THE SALES FOR A SUPER WARM PUFFER OR PADDED COAT? TELL ME IN THE COMMENTS OR TWEET ME @NOTLAMB! No featured favourites this week due to my recovery I’m afraid… they’ll be back next week! So ad you are on the mend and taking it steady. I had exactly the same criteria for a coat a. Outlet of years back plus I also wanted down. I scored the perfect on in uniqlo half price. Rachel thank you for the well wishes!! It’s so satisfying when you’re looking for something very specific then actually find it, isn’t it…?! This coat is fabulous on you! I know what you mean about a puffer coat needing some shape with a belt. I feel exactly the same way. This one is beautiful. I bet you are the glammest and most happening babe out there amongst the dog walking set! What a fabulous coat! I love the color..so feminine but looks so cozy. I love it when all the checklist points come together at a great price. Good buy. Being warm is a top priority for me too. This coat seems to do the job well and with great style. And I love how you went for a lighter colour. Our streets are crawling with dark colour. Thanks for the linkup. Continuing wishes for a full recovery soon. That coat is so cute! Your dog is so cute!!! I love it when your doggie makes an appearance in your posts! 🙂 Glad you are staying warm in that cozy-looking coat, and glad that you’re recovering well from your surgery! OMG Lieske my brother is a cyclist (as in racing) and I have NO idea how he copes with so little on when racing. I know you work up a sweat and get warm but all that cold air blowing onto me in the winter would make my hands go to blocks of ice… HOW do you do it?!!!!! Your coat is beautiful! I love the color and the belt. YES, I have a similar coat but in a grayish/black. They are absolutely necessary in my frigid northern climate. It’s a lovely coat and I’m sure it’s more than warm enough for an English winter but I’m afraid that you’d freeze to death over here with the winter we’ve been having. My down filled parka is good to minus -45F and I’ve still been cold some days. If you look around a typical morning commute on the subway everyone is buried in layers of mostly black & navy – and that’s because of all the snow and then slush we have to deal with – never mind the sand and salt poured onto the streets – a lovely grey/white coat like yours would have to be washed weekly! Margie I used to live in Canada when I was little so I know EXACTLY what super cold Canadian winters are like, and no we don’t get them anywhere near that cold over here in the UK!! I don’t even want to live in the north of England because it’s colder up north than it is compared to down south, and that’s only a couple of hundred miles away. But here you still get blokes wearing shorts and t-shirts when it’s around zero and I’m bundled up like this. Kids too. So my idea of really cold is a lot milder than what many people think of as cold… I am NOT a cold weather person – give me +30C any day!!!!! I love the new parka you are sporting here, I don't have a puffy jacket that can withstand the Bulgarian cold winters, I recently bought one online, will see how it is when it arrived. I love that coat!! It would be perfect for our weather here! Oh it’s a great puffer coat, Catherine! You look adorable and very cozy and warm. I had been opposed to puffer coats for so long then finally last year, I caved in a got one. It is very similar to yours in style and length but in a really cool deep slate blue color. And it is perfect for the bitter cold that I experience where we live. I am so glad I have it! I am glad that you are recovering well, my friend! My hubby and I are a bit obsessed with coats and jackets. Between us, we’ve got LOADS lol. Coats have to look good, don’t they? It’s ok to have one that’s a bit scruffy and warm for walking the dog but otherwise, I want to look stylish, even though it’s cold. I’ve now got a few puffer jackets that look gorgeous too – the last two I bought from Massimo Dutti and I love them. I’ve had two while coats before and I swore I’d never choose that colour again because they always seem ti get filthy on me lol. But I LOVE yours – is it more of an off-white? Light grey? It look gorgeous on you. I love that it’s belted (I usually go for belted options too). This coat looks fabulous! Outwear is my downfall in fashion. Ok, so is my hair. lol. Anyway, this proves that knowing what you want and sticking to it is rewarded sooner or later. Btw, I love the shades and boots as well. Thank you for sharing and hosting! When you have a coat like yours that’s all you need when you are out and about to look stylish. Love it! I hope you are recovering nicely and I’m so glad to hear all is well. This is a lovely look and what a fabulous coat you found. I’m glad to hear that your recovery is going well and without complications. Thanks for the link up and I hope you have a restful week ahead. I was so pleased your operation went the minor route. I looked out for the updates thinking of you last week. Super coat. Really snuggly looking. Stunning coat – I am deciding whether or not to order it… hesitating because I bought a new coat just last week! Machine washable too! I love the fact it isn’t filled with down (only need that when it gets to double figures below freezing), also eliminates the need to tumble dry with tennis ball – we made a conscious decision not to buy a tumble dryer. It’s VERY lucky that it’s machine washable Susan, especially being such a light colour!! What a perfect example of how you can still look stylish while doing our mundane things, Catherine!! I hope you are healing fabulously and I’m sending tons of love and prayers!! Lovely snug and cosy coat! I do like a coat that keeps my neck warm and a hood that actually stays on instead of falling off with the first gust of wind!